Ever wanted to quickly edit the text on a submission button to say “YAS KWEEN, ENTER” instead of “ENTER NOW” or received a last-minute request from a client to also launch a Spanish or French version of a digital campaign? If so, you were probably left scratching your head trying to figure out how to pull that off without extending your timeline and increasing spend on your campaign’s development costs to build separate campaigns for each language. Our entire team is celebrating the launch of our new translation and text customization features in the Drag-and-Drop Builder. The feedback and requests we received from current and potential customers, from agencies to brands, has been so helpful as we got to work developing these new features in the Wyng Platform – thank you! This release gives our partners the power to manage and customize video, photo and form uploads across various digital campaign types in the Wyng Platform. We can’t wait to see how you use the tools to create customized and multilingual campaigns that can now be launched in over 6,000 different languages (yes, you read that right! ), lowering the bar for creating global campaigns that span languages and cultures. Find out more about the how the new text translation and customization features work below. We’ve added new text customization and translation features to the Drag-and-Drop Builder within the Wyng Platform. This feature will enable marketers and developers to easily set up campaigns that feature custom prompts and direction for video, photo, and form uploads in English and over 6,000 other languages! 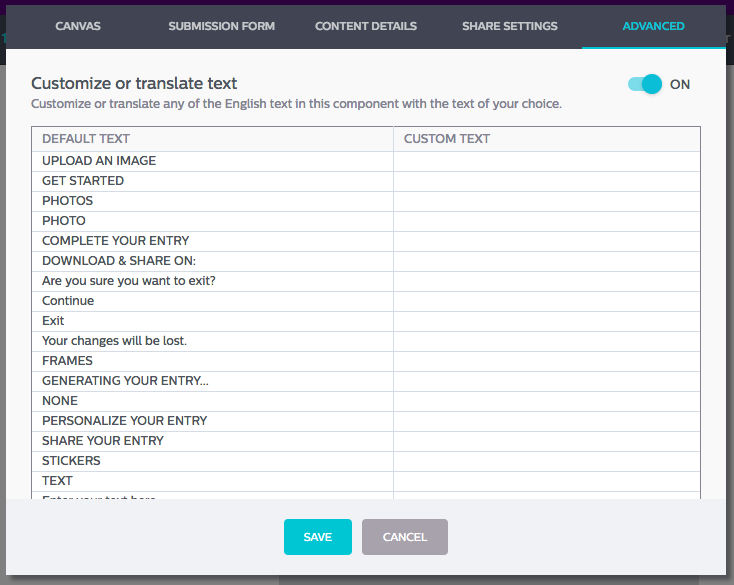 Marketers and developers will be able to select the text customization and translation features when setting up a new campaign or adding to an existing multi-page campaign in the Drag-and-Drop Builder (pictured below). 1. Start with a photo, video or form-based Use Case from the Create tab, or Design Your Own to create something fully custom. 2. Scroll down to the direct upload component of your campaign and select the editing tool displayed in the right-hand corner (the pencil icon). 3. Click on the advanced options tab. Here you will see the option to customize or add translated text. Turning on this option will give the ability to customize or translate any of the English text in the form component with the text of your choice! 4. Once you’ve turned customized or translated text on, you will see a long list of the default English text prompts in the left-hand column. 5. You can add your customized or translated text for any of the default text prompts in the right-hand corner. Unlike most other text boxes, there is no character limit to accommodate for the different characters used in other languages, such as Mandarin or Russian. 6. Once you’ve added your text, hit save and the changes will be reflected in the Drag-and-Drop Builder for your campaign. 7. If you are running an English campaign and want to add a complimentary page in a second, third, or more language, you can take advantage of the multi-page campaign feature. Doing so, will enable you to launch multi-language campaigns easily with consolidated results and a central campaign URL. Learn more about enabling multi-page campaigns with Wyng here. Due to the high interconnectivity and global-access that the digital revolution has provided, agencies and brands can no longer just concentrate on domestic markets if they want to remain competitive. With over 7.4 billion people on the planet, and only 360 million English speaking people, marketers and communicators need to also be thinking about those other 7 billion and how they can be reaching and engaging them around their brand, product, or experience. The text translation and customization features, paired with the multi-page campaign features will enable all marketers and developers to easily create global campaigns in multiple languages, increasing your teams’ capabilities and prospective audiences. Customizing the text of your campaign in English, or expanding your campaign for Spanish, French, or any number of different languages is a great way to increase engagement with your campaign, by creating dynamic and interactive campaign sites that appeal to a broader and more diverse group of consumers without breaking the bank.